Buckingham Athletic U18s capped off a memorable season in fine style by winning the Allied Counties Youth League Central Division title courtesy of a 6-2 thrashing of Highmoor Ibis. The title race came down to the final day of the season but Athletic showed few nerves to run out convincing winners and take the title by two points from Thame, who pushed them all the way. 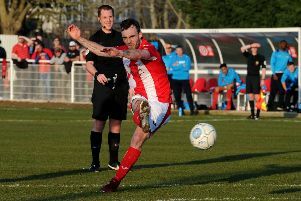 All the damage was inflicted in a rampant first-half display, and Rory Busby was the star of the show with a stunning four-goal haul before half-time. Busby got the ball rolling early on to settle any early nerves before he turned provider to tee up Geraint Minney, who doubled Buckingham’s advantage. The goals kept coming for Athletic and Busby in particular as a near-post finish made it 3-0 before a fine solo effort, sweetly-struck from 25 yards, completed his hat-trick. With Athletic showing no mercy, still there was time for more in the first-half and Minney soon added his second before Busby scored his fourth and Buckingham’s sixth on the stroke of half-time. The destiny of the title was now in no doubt, and that perhaps played a part in Athletic easing off the gas and allowing Highmoor to add a modicum of respectability to the scoreline by scoring two second-half goals. There was only one team celebrating at full-time, however, and that was Buckingham Athletic, whose youngsters made the most of a fine achievement.